Shining A Light On Wasted Ad Spend. Most digital automotive marketers know that VDP views are a vital driver of sales. And, to be more precise, most industry experts agree that a VIN requires 30 views to sell. But over what time period should those views occur? Our proprietary research has determined that the most effective pacing of those 30 views is 30 days. But is that the reality on dealers’ lots today? We initiated our new 1H 2016 VDP View Dealer Report to find out. Are they driving those 30 VDP views to every car on their lots? Are the VINs that are receiving 30 views in the recommended 30 days actually selling more quickly? Our most important findings are critical for every dealer’s digital marketing success. The report shows that 72% of the studied dealers’ VDP views piled up on only 25% of their inventory, representing a major waste. And, that the remaining 28% of their VDP views were scattered over 75% of their inventory, which is a major missed opportunity. 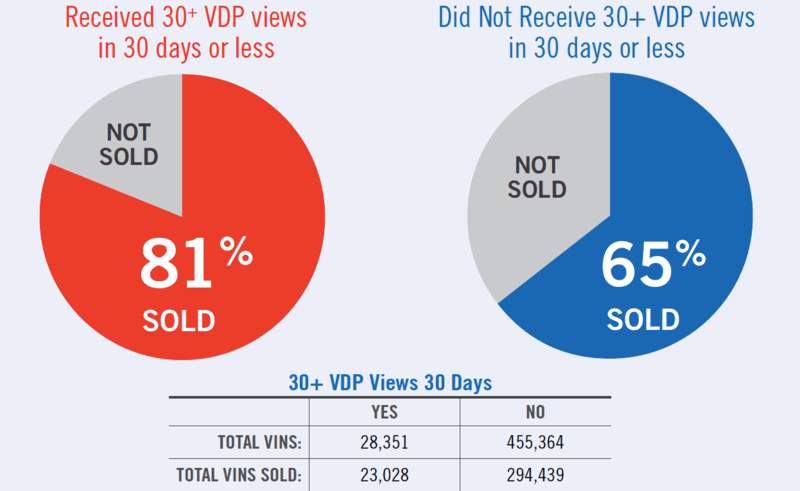 Image: Distribution of VDP Views and Average Number of VDP Views Per Quartile, LotLinx Inc.
Additionally, we saw that VINs that were receiving 30 VDP views in 30 days were more likely to sell than those that did not receive the recommended views. Image: VIN View Comparison – First Half 2016, LotLinx Inc. The report is the clearest example yet of the importance of understanding exactly how much attention each car in your inventory is receiving, and from what source. The LotLinx VIN View Optimizer™ can show you – with precise detail – which cars on your lot are already receiving the VDP views needed to sell on time, and which need greater exposure. Armed with that information, you can target your spending where it’s needed most, and eliminate waste. Be sure to download your copy of this important report, right now. In today’s competitive environment, it’s never been more important to boost precision and eliminate waste. A LotLinx digital strategist would be happy to tell you more about the power of VIN specific strategies. Give us a call 1-800-625-LINX today.